March 09, 2017, 10:02 p.m.
Whatever benefits President Donald Trump may have received from his well-regarded address to Congress last Tuesday have vanished one week later. The latest Economist/YouGov Poll puts negative assessments of the President in about the same place as they were a week ago, with a majority of Americans continuing to say President Trump is temperamentally wrong and not experienced enough for the job of President. 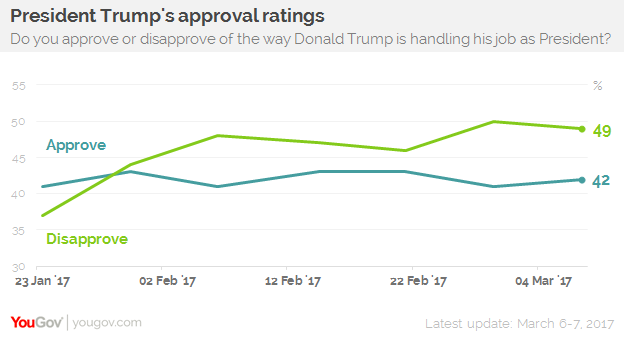 His approval rating remains essentially unchanged from a week ago. In the poll conducted Monday and Tuesday, after a weekend in which the President charged his predecessor with conducting wiretaps at Trump Tower during the 2016 Presidential campaign, more Americans side with what former Obama Administration officials have said about those claims than believe officials from the current Administration. 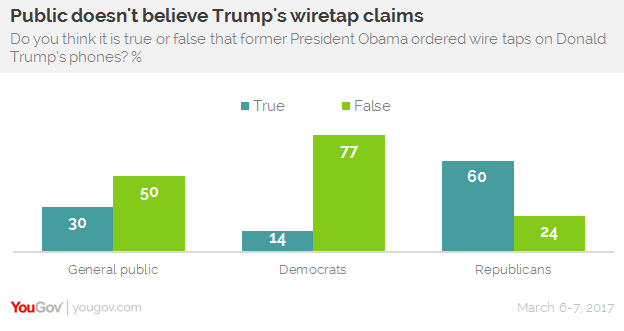 By five to three, Americans say President Trump’s charge that Barack Obama ordered taps on Trump&apos;s phones is false. Half say that the President has no evidence to support the wiretap charge, which he made in early morning tweets last weekend. Only one in five think he does. Republicans, however, generally support the President’s claim: by 60% to 24%, they believe it is true that President Obama ordered taps on the Trump campaign; by 40% to 21%, they think President Trump has evidence for it. The charge was made on Twitter, a favorite tool of the President. His use of that tool for communication has been seen as unseemly by many. In this week’s poll, more than twice as many Americans think the way President Trump uses Twitter is inappropriate than think it is appropriate. Republicans have a more favorable view of the President’s Twitter use, but their margin this week is narrow. 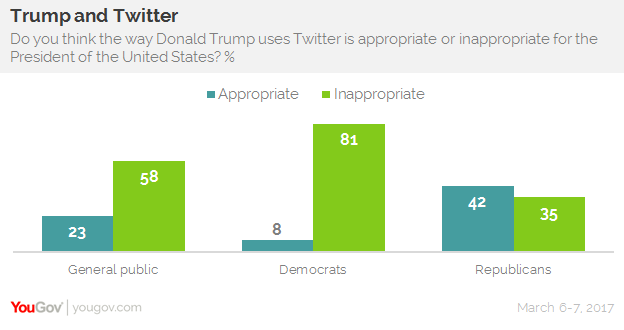 More than a third of Republicans say President Trump’s Twitter use is inappropriate. 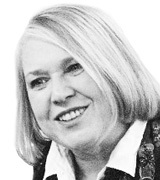 There is, however, a larger concern that has troubled the new President through much of his short time in office — the relationship between his campaign and Russian officials. That relationship remained news last week when it was discovered that Attorney General Jeff Sessions had not told Congress about contacts he had with the Russian Ambassador during the 2016 campaign. Sessions recused himself from any role in investigations of Russian efforts to manipulate the presidential election — a decision met with approval from the public overall, and from Republicans in particular (though not the President). In both cases, half agree with Sessions’s recusal. 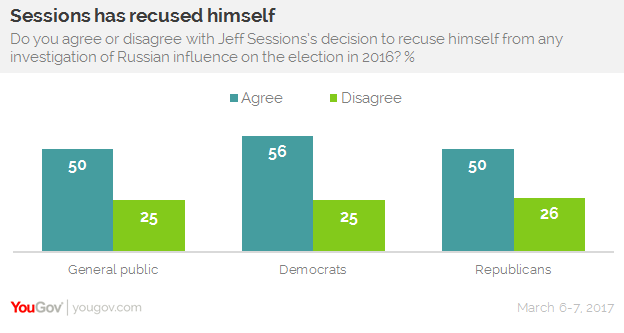 Some would go even further: 43% think Sessions should resign from his position as Attorney General, while 30% think he should stay on the job. Just 17% of Republicans think Sessions should leave his post, while nearly two-thirds of Republicans want him to remain. 61% of US adults say Sessions’s lack of disclosure of those contacts during the campaign is at least a somewhat serious problem. Only one in three Republicans agree. Sessions’s overall public image is negative: 26% have a favorable view of him, while 38% are unfavorable. As for other possible Trump Administration contacts with Russian officials during the campaign, by more than two to one, Americans believe Congress should investigate what happened. By nearly the same margin, they would support the appointment of a Special Prosecutor. One in three Republicans think Congress should investigate the contacts; one in four Republicans favor appointing a Special Prosecutor. By more than three to one, Americans think there also should be a Congressional investigation of Russian attempts to hack campaign emails during the election. On this, majorities of Republicans, Democrats, and Independents agree. When it comes to the President’s overall rating, this week 42% approve of how he is handling his overall job, while 49% disapprove. Judgment is extremely partisan: 81% of Republicans approve; 79% of Democrats do not. Personal assessments of the President’s capability have changed little since the campaign. By 52% to 32%, the public says he does not have the temperament to be President, and by 55% to 34%, Americans believe he does not have the right experience. Half say he is not qualified (37% think he is). A majority even thinks he is likely to get the United States into a war. Evaluation of the President’s handling of specific issues, however, finds a plurality on the positive side when it comes to two critical issues — the economy and terrorism. But on other issues that the new Administration has focused on during its first 50 days, such as health care and immigration, the public is clearly divided.